Lipari is the largest island of Aeolian archipelago; it extends over the surface of 37,6 km ², 9 km long, and circa 5 km large. Lipari is the second island for the distance from the Sicilian coast, and is divided from the volcano by a small part of sea, of half a mile circa, called Bocche di Vulcano. It is about 22 miles away from the Milazzo Port. Lipari, with its 11.000 population, compared to other Aeolian islands, assumes the connotations of a town; there are a hospital with the hyperbaric chamber, a safe port, and all those support services necessary to navigators. The main docks, like touristic ports are situated on the east side, divided between them by a rocky hill where the castle of Lipari is situated. Inside this fortification you can find : the archaeological museum, and various historical buildings and archaeological sites. Located north of the Castello, there is Punta Scaliddi, going till the pier, which borders the northern side. The commercial pier is used as a landing place for ferries, as well as the first 20 meters of the adjacent pier, situated on the left side, and cleared to facilitate the moves. The remaining part, circa 120 meters of the pier , are used by touristic boats, which are permitted to stop only for passengers’ landing and boating; during the evening time the stop is only permitted to the pleasure boats. The northern part of pierce of 70m around, with the seabed of 8m in the header is used for the stop of pleasure boats, excepting the last 10m, used for lifeboats. The port complex has a capacity of circa 50 boats, the pier’s depth between 4 and 10 meters, and it suffers from eastern winds, grecale and sirocco. Pay great attention while crossing the ferries. The Canneto landing on the North of Marina Lunga is situated after the Monte Rosa hill, where a pier of 60m overlooks upon a sandy seabed between 2 and 5 meters. The pier’s header is used for the boats transporting people, only for time necessary for landing and boating. The northern and the southern side of the pier, where the stairs are collocated, are used for landing and boating of small touristic units. The pier suffers from the winds of the 1 and the 2 quadrant, and constitutes a perfect shelter for libeccio and mistral winds. It is possible, paying a great attention to submarine cables, anchor at the northern part of the Monte Rosa Hill, upon a seabed between 10 and 70 m from the coast. Portinente is the docking situated southern of the Marina Corta, usable only by small boats of little fishing, near to a pier, 50m away from the foreshore; it is possible to anchor upon a sandy seabed of 10m. It suffers from the winds of the 1 and 2 quadrant. 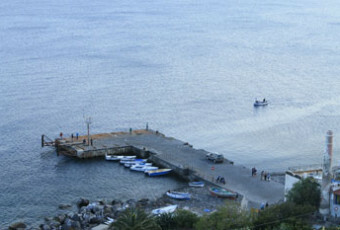 The small port of Pignataro, situated northern of Lipari’s Castello ; constituted of a breakwater pier with wharves, provided with bollards, and moorings, has a maximum capacity of 250 boats. The pier’s header on the North delimits the boathouse, and is only used for ferries. The shelter port of Pignataro extends over a surface of a crystalline water of 34,000m²; but only 6,000m² are assigned for tourists’ receiving, whose capacity is of 40 boats. The boathouse of a recent construction, has a sliding slipway, cranes up to 70 tons, garbage service, telephone, wall sockets; besides, near to the area there are: a hospital, a hotel, banks, post offices, chemists’, workshops, pubs, restaurants, foodstuffs, and all those services connected sea tourism, and others. The boathouse offers a perfect shelter in the case of winds from the 1st to the 4th quadrant, but is exposed to the strong winds of osthro and libeccio; the winds of the south-east provoke undertows. Be careful, especially during the evening hours to the numerous buoys at the west of the boathouse, which make it difficult to access. The boathouse of Marina Corta, located south of the Castello fortification, consists of a pier at “Y”, where at the point of the two pier’s cross, the San Onofrio Church is situated. The unusual shape forms the two boathouses: the bigger one is collocated northern of the church, it has many wharves, and is delimited by a pier extending in the north-eastern direction; mainly used by fishing boats. The second boathouse, collocated south, and much more smaller, allows to moor small pleasure boats, usually occupied by charterers. It is forbidden the docking on the south-eastern side of the pier, intended for hydrofoils and line catamarans. The boathouse is a decent shelter, because it is exposed only to sirocco winds on the South, while on the north it offers an insufficient protection against winds of the 1st quadrant. The surface assigned to amusement is of 500m² out of a total 10,000m² of water, and it allows a reception of only 10 boats. The port complex of Porticello is situated north-east of the extreme Punta delle Castagne, collocated north-east of Lipari, is composed of various piers, and even if it does not assume a touristic role, we decided to cite it. The northern pier is used for a docking of ferries and cargo ships; the two southern metallic ones are for an exclusive use of one society. Located north of Castello it extends from this point towards Pignataro Port; the bay has 5 piers, and is ruled by the winds blowing from the south, south-east, east, and north-east.